I feel like there’s a rather large amount of superstitious people in America. More accurately, there’s a lot of people who take superstition seriously. But even non-superstitious people will say or think superstitious things as a joke sometimes, won’t they. This entry’s theme is superstition, and of course there are both a lot of types of superstition, with regional differences as well. Let’s take a deeper look into superstitions about good luck, bad luck, and fortune-telling! "if you find some kind of rare item, you’ll have good luck". Obviously the most common example of this is the four-leaf clover. The basic idea is that if something with a very low likelihood happens to you it’s "lucky", and other good luck is soon to come. 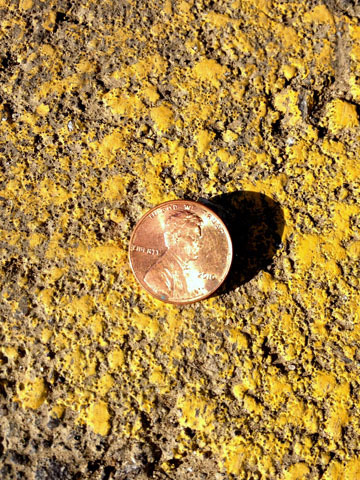 Aside from the four-leaf clover, there’s also other good-luck items, like finding a penny face-up on the street. これで幸運になるんだそうです。 / Supposedly this brings you good luck. Good-luck charms are also a common thing. They can be anything from the just-mentioned four-leaf clover, to odder items like rabbit’s feet and horseshoes. These items have been used as good-luck charms for centuries, but the reasons for some of their use are lost in time. 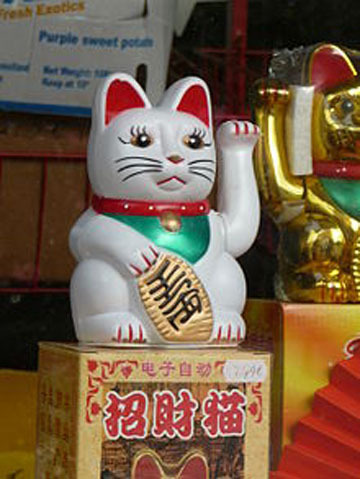 Probably the most typical good-luck item in Japan is the "maneki neko", commonly called the "lucky cat" in English. Japan also has the good-luck superstition that the first dream of a new year is sure to come true. 猫が幸運を招いている。 / The cat is beckoning in good fortune. It seems like there’s a lot more bad-luck superstitions than there are good-luck ones. 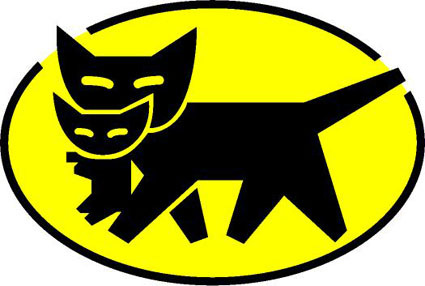 In America, it’s said to be bad luck if a black cat crosses your path in the street. One reason for the superstition may be that in the past, black cats were associated with black magic. Thanks to this, there might be some people in the States who wouldn’t be the biggest fans of the "Kuroneko Yamato" mail service in Japan, haha. 荷物と共に不運が届くのか？ / Will you get some bad luck delivered along with your package? Unlucky numbers are also a big thing. In America the most widespread unlucky number is 13, leading to a number of strange practices. For example, it’s not uncommon to find buildings which skip 13 in the floor numbering, going straight from 12 to 14. Despite the fact that the "14th" floor is still the 13th level of the building. 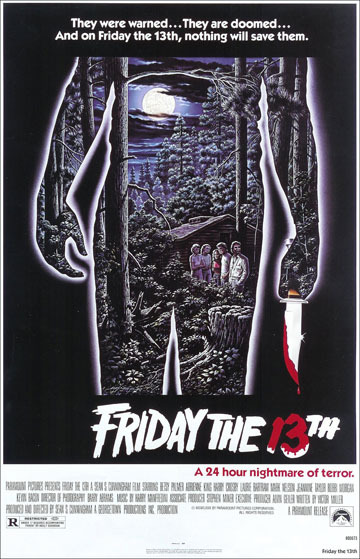 On top of that, for just-as-mysterious reasons any Friday the 13th is said to be especially unlucky. As far as Japan’s unlucky numbers go, the main one is 4, owing to the fact that it has the same pronunciation ("shi") as the word for death. When you go to a Japanese shrine, one thing people often do is draw "omikuji", a form of fortune-telling. the could also be considered a form of superstition, huh? In America people often read their daily horoscope for fortune-telling. The horoscope is basically a fortune that varies depending on what day you were born. It’s popular enough that a horoscope is printed in most daily newspapers. If you’re just reading them without being too serious about it though, horoscopes and omikuji can both be fun. 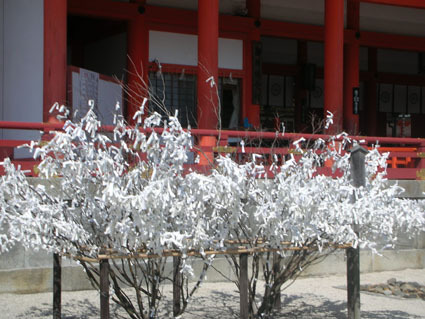 木に結ばれた御神くじ。 / Omikuji tied to a tree at a shrine. America also has a number of fortune-telling games. For kids, there’s the magic 8-ball. Taking the form of an 8-ball from a billiards set, you ask it a question, shake it up, and get your answer from the window on the bottom. Another well-known "ask a question and magically get an answer"-style toy is the Ouija board. I wonder if Japan has any similar things! マジックナインボールの使い方 / The magic 8-ball. I couldn’t really find any tracks directly related to the theme, so here’s one just related by words. Have a listen to Mr. JAKAZiD’s interesting remix of Daft Punk’s Get Lucky. but I think we all can’t help a little bit of it now and then!